Our rental shop is centrally located in Berlin-Mitte on Friederichstrasse, right next to the Friedrichstrasse U and S-bahn station. Stops: U6, S1, S2, S25, S3, S5, S7, S75, M1, M12. to bike-friendly Berlin! Discover the greenest capital in Europe on a perfectly landscaped street network with special traffic lights and bike paths for cyclists so that you’re safe on the streets of Berlin while still having fun. 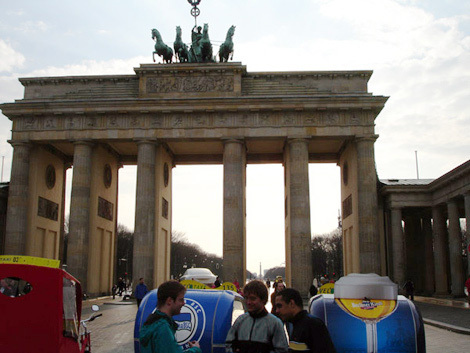 Our rental is located in the heart of Berlin at Friedrichstrasse station, near the Reichstag and the Brandenburg Gate directly at the Berlin Wall tour path- an ideal starting point for your city tours. We are open 7 days a week to offer you three different types of aluminum city bicycles from the brand GIANT. The bikes come in four different sizes and are never more than a year old. Pick-up or delivery outside our opening times is available with consultation.